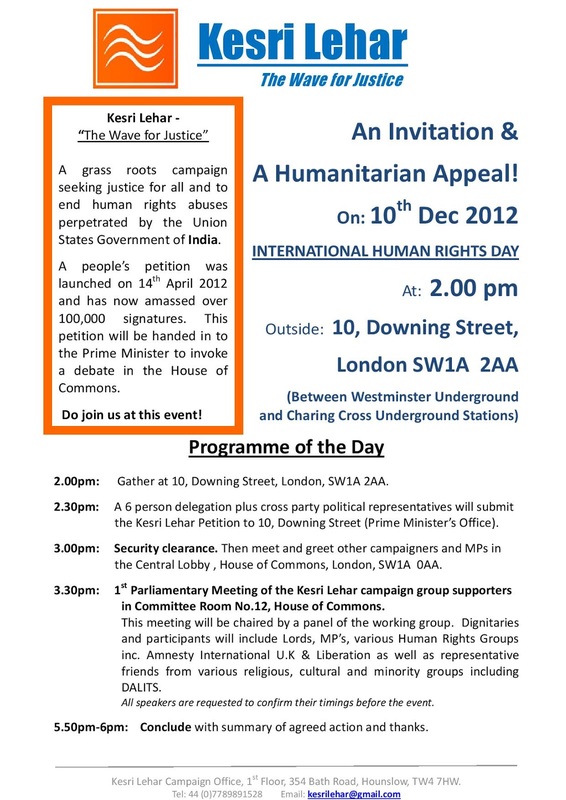 On December 10th, 'International Human Rights Day', a 6 person delegation containing representatives from Amnesty International, Liberation, Human Rights Internet, Dalit (oppressed Indian Caste), Christian & Sikh Groups will be submitting the 'Kesri Lehar' (Wave of Justice) petition containing 118,000 signatures to the PMs office. The petition urges India to abolish the death penalty and improve its atrocious human rights and custodial torture record. Thereafter, all who support the Kesri Lehar ideal, shall hold their first political gathering. Representatives from all aforementioned groups, MPs who have supported the petition, members of the House of Lords will address this meeting - as well as prominent local Sikh community leaders. In addition to this, EDM 296 ( http://www.parliament.uk/edm/2012-13/296 ), which urges the UK Government to press the Indian government to ratify the Rome Statute, is also picking up momentum. There are now 65 MP signatories, 15 from November alone. It is important that we all attend this historic event. Leaving at 10:30am sharp. Email info@sikhalliance.co.uk to reserve your place.